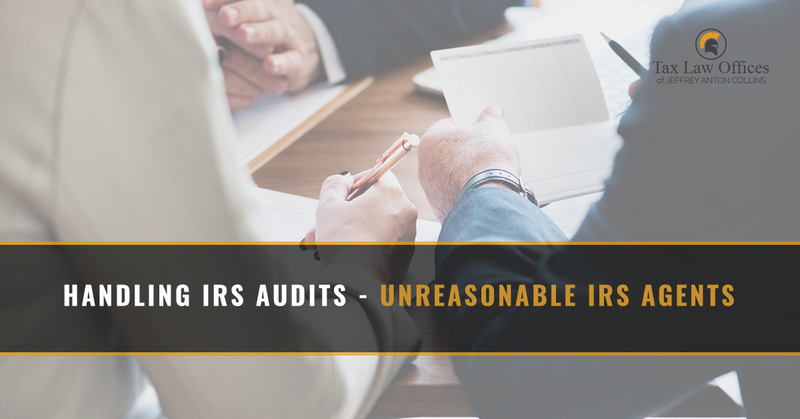 Dealing with an IRS Revenue Officer can be overwhelmingly intimidating — especially if one stops by your home or business for the first time unannounced. You may feel like your heart is racing. You’re confused. Frankly, it doesn’t make sense as to why the officer is at your door. As far as you’re concerned, you paid what you owed. Now, the anxiety you may be feeling due to this encounter is real; it’s valid. However, it may be misplaced. In the article below, Jeffrey Anton Collins, a tax consultant to those in over $100,000 debt to the IRS, explains how to handle an unreasonable officer. Before we dive into how to handle an unreasonable officer, it’s best to define the difference. An IRS Agent is employed by the IRS to conduct tax audits. A Revenue Officer is employed by the IRS to collect money. For the purpose of this post, we will share how to interact with an officer. Revenue Officers will have a badge, and it’s plastic. If you encounter an individual flashing a gold badge at you, it’s probably the IRS Criminal Investigation Division (CID). In this case, call a tax attorney immediately. A Revenue Officer does not have the authority to arrest you. However, the Revenue Officer can make a referral to the CID, including the facts and information of your case. Typically, referrals happen in instances of fraud. The CID only accept and pursue a small fraction of those referrals. The Revenue Officer position does not require a financial background. The only type of qualification for the position is a four-year degree. For example, an individual can have a Bachelor of Liberal Arts and be qualified for the job. You may have assumed that Revenue Officers are awarded on how much money they can collect, but it’s not true. Officers are measured by how many cases they can remove from their inventory of collections. As an example, a Revenue Officer would rather you take an “offer in compromise” than ignore them for years. Revenue Officers simply want to close the case. Many of them are straightforward, honest people, who want to do their jobs. They have families at home and bills to pay. However, you may encounter a “pushy” officer. In this case, it’s important that you contact a tax attorney to help you negotiate what is a reasonable “collection agreement.” Most taxpayers want to get their debt behind them so they take the deal that’s offered. This is not ideal. You want to negotiate and reach a reasonable agreement. Understand that this article is a brief collection of information that can help you handle Revenue Officers if they make contact with you at your home or business. Ultimately, if you’re in more than $100,000 in assumed debt to the IRS, you will want to contact a tax attorney to handle the negotiations. Complex tax law can be overwhelming. Unreasonable IRS Agents and Officers do exist. Don’t deal with the IRS alone. Call your tax law consultant today!